Welcome to the inaugural issue of The Weekly Pep Talk; commentary on life for women who run. My name is Stephanie Atwood. Many of you know me from my work as a running coach. There is more to life than running yet, when Running Becomes a Part of Your Life, it will influence all other aspects. This was the impetus for writing this weekly digest. We all have lives outside of our running yet; running has brought us together in one way or another. I want to share all kinds of news and information that are related to us as runners and as women! and specifically the Bay Area, it’s because that’s what I know. and, if they are well organized! Right now, I’m focusing on the Kaiser Permanente Half Marathon and 5K Run – February 3, 2008. Starting today, you have 10 weeks to get prepared for this race. 10 weeks is enough time for either event. For the Half Marathon, you should already be running, even if not training officially for this race. I’ll give you an intermediate training schedule for the half marathon. For the 5K (3.1 miles) you can start from scratch and be ready for this fun event. already started training, Now Is The Time!! there was no Title 9. I failed miserably in my attempt, having no idea how to pace myself. self-made and I could change them! This was a wonderful awakening for an 18 year old. Graduating from high school created many life changes as I headed out on my own, not knowing what direction to go in. Living on my own, with a full time job and part time attendance at a community college, gave me ultimate freedom and limited time. I stopped exercising and gained more than 40 pounds. Oh, those morning doughnuts, endless cups of coffee and sitting all day were changing me in ways I hadn’t realized. I had so much to learn about what really mattered. not common, especially for women. One time around the block equaled 1/8 of a mile. It took about a month before I ran 8 times around that block, but I was on my way! marathon and placed third female! Another milestone had been reached and I was hooked. I have been running ever since. and the psychological/emotional lift that running has given to me. occurred and, as any runner knows, they just happen! How could I give that up? have the wonderful memories and knowledge of the commitment I made when I COULD run. I would carry within me the solace of knowing that I was given a gift and took full advantage of it while I was able. exercise; these are what matter! Amy Montemarano started a new website for women who travel and want to run with other women during their stay. She offers information forvacation sites and for business travel. Check out her website at www.womenruntheworld.com. Isn’t this a great idea? Thanks for putting it together Amy. will launch in early January, 2008.
this summer and the NYC Marathon in November of 2008.
excited to see how this digest evolves. contact me directly. We’re going to have a lot of fun with our Weekly Pep Talk! P.S. Photos were added in this current version for a nicer presentation. These early issues were originally published as emails from word documents. This quote was retrieved from our January 2010 Weekly Pep Talk. This newsletter, The Weekly Pep Talk, has been sent consistently since 2007! May Birthdays – Lily Chien-Davis, Edie Cote, Faith Wolper-Terwilliger, Kim Lowe, Kelly Woodard, Kathryn Levenson, Christie Aereias, Gretchen Treffilletti, Jessica Mangaccat, Michaela Ristaino, Pam Skiles, Aisling Lipton, Ingrid Canepa, Becky Freeman, Sara Tarantino. Happy Birthday Ladies! Maca. Who knows about maca? I know some of you use it already and I am thinking of adding Maca Capsules to our current supplement list at AtLastTheBest.com. What is maca? It is a root, grown in the high altitudes of South America. It is totally natural and has been touted as having magical qualities including higher energy levels, hormone balancing and increased libido. My main interest, as a nutritionist and coach, is in a natural pick-me-up as a morning alternative to coffee. Maca is high in natural starch, meaning it has a high glucose content. This is clearly part of why it would give someone energy. I know of people who put a bit of maca powder in their smoothies in the morning for its “super food” benefits. However, the 1 tsp. recommended dosage does not infer that one would get a sugar rush. Granted, the powder is dehydrated and much denser than the fresh root but there is probably more to its energy potential than just its starch content. I have tried maca powder sprinkled on oatmeal and found it quite unappealing. Some describe it as “tasting like dirt”. Thus, the capsules (or v-caps) to be precise (vegan-caps) would offer the energizing effect and the convenience of taking the supplement whenever you like rather than having to blend with other food. Tell me if you use maca and what your experience has been. I am very interested in whole food nutrition and supplementation, when possible. Maca seems like a good option and one that I am adding to my morning regimen. Who else takes maca? Here is a link to an interesting article about maca and the appropriate dosage for healthy use. Fill in your workouts online through our WOW Team/Strava Challenge (Kim C joined!) or continue using the paper form for the WOW Team Challenge. Your choice but be sure to DO IT! If using Strava just list Go WOW in the title of your workout to distinguish it from other non-WOW workouts. I’ve been listing all my workouts based on time, not miles. You can do both but I will only list my races with times. This will keep the rest of my information a bit private while still sharing the important stuff and keeping me “honest”. Link to the WOW Team Challenge Form. Are you filling in your WOW Team Challenge Form? We have several members who have claimed their 10 hour dog tag. Come on ladies! There are more of you out there! Please announce your 10 hour achievement on Facebook and keep track of your hours. We will reward you at our next Wednesday or Sunday workout and will put your photo on the Facebook Winners Circle and Go WOW Team page. Who else has gotten to Level 2 at 10 hours completed? Now, keep going to the next level at 50 hours! That’s some major miles. I am now at 48 hours and zeroing in on the 50 hour badge. Who else is there? Marathon Minute: from Coach Lauren – Read more about WOW Team Mentors on our Website Blog. These posts go all the way back to 2010. They did it! The Golden Gate Relay is now over and seemed like quite the event. They started in Calistoga and just kept going until they got to Santa Cruz. Congratulations to the 12 women who participated: Karin T, Lizette B, Allison H, Leslie G, Gina H, Gretchen T, Lori W, Jessica M, Michelle K, Cecilia H, Nicole D, Tres F! We are in the process of putting together a book about the experience and will let you know when it is published. I will produce a Kindle book first and, who knows, we may turn it into a best seller! Happy Mother’s Day to all you mothers out there. It always surprises me how many of you choose to get out and run rather than sleep in. You are some awesome mothers! It was great to see Sophie J join us last Sunday after having just graduated with her Masters in Family Counseling while also running a family with 3 small children. So good to see you Sophie. Keep coming! Coach Lauren is on a trip to Greece and Turkey until mid June. Yikes! What am I going to do? Have a great trip Lauren. We miss you already. The half marathon and 5K training is going well. I see our new members gaining strength and speed. If you stick with the plan you will be well prepared on race day for a quality race. And, I can guarantee you will not finish last! So much of participating in a race is the confidence to finish. All of you have already completed the distance many times or, if you are training for the half marathon, you are building steadily. Now it is just fine tuning your training and sticking with it. Don’t give up! You can do this! Additional: Coach Stephanie will go over the 10 day program for how to burn more of your body’s stores of fat. This is based on her best-selling book Belly Fat Blowout and works for already lean athletes or “wannabe’s who would like to reduce that donut around their waist. It’s free and you will learn a lot. See you Wednesday, Thursday, or Sunday. I’m up for this. How about you? Big Sur it is! You voted, we listened! Go WOW Team will be participating, once again, in the Big Sur 5K and Half Marathon on November 7-8. Mark your calendars now as you have to sign up early to be guaranteed a spot in the race. You also need accommodations and Go WOW handles some of this, or you can do your own. Either way, you need to prepare EARLY. Start your own WOW Team neighborhood group. We’ll help! We’re just in the testing stages of this but if you want to start your own group contact StephanieAtwood@gowowliving.com. Let’s expand and share the Go WOW LOVE in your city or state! Go WOW Team is our team website! http://gowowteam.com. RSVP on Meetup – Whether you are a member or drop-in, please RSVP on http://meetup.com/gowowteam . Members do not have to pay an additional fee, just click through when you RSVP. Your Meetup RSVP also assures that if we need to cancel, you will be notified! Books are also available online at our new website at http://atlastthebest.com and on Amazon in Kindle format and paperback. Belly Fat Blow-out 2! http://amzn.to/19hyouV Sequel to the bestselling Belly Fat Blowout 1. Lose inches, balance blood sugar, reduce night sweats, burn fat and be a better athlete. Belly Fat Blowout Book 1 http://amzn.to/ZkB8A2 . Now in paperback, too. Run Faster Race Better http://amzn.to/Wi5Qfg Now in paperback, too. Share your updates and photos with us on The Winners’ Circle. Let’s help each other stay accountable and let each of us know that we are important. That’s what running buddies do! That is why the WOW Team exists! Let’s get this done together. Go Running Buddies! Note that meetup and the Go WOW Team website offer directions by clicking on the maps and location links. It’s better, oftentimes, to look over our pre thought out descriptions than just setting your GPS and heading out. Some of our locations are difficult to find using GPS because they don’t have a precise address. When you RSVP if for any reason we need to cancel, we can notify you. Please RSVP. Thanks! Questions, comments? Post them on Facebook, if possible. Meetup works too. May 16 – Saturday Trail Runs, check with Tres on the series of trail runs that she will lead for intermediate runners. First one is May 16 at 1:00. Details on Meetup. May 23 – Saturday workouts with Susan Haworth in Alameda. Susan has offered to help out with some Saturday fun workouts for all levels. Starting On May 23, with about one each month. Details coming soon on Meetup. Specifically geared to racing in the USATF Sponsored Series that offers money and points to qualifying teams. Any woman may join us who loves to compete. You don’t have to be a WOW Member because this group will require separate, individual membership and annual team membership and insurance through USATF (United States Track and Field). Group information is available at http://meetup.com/bawrf-usa .There is a lot of information on the PAUSATF site, too. We list ourselves as BAWRF or Bay Area Women’s Racing Federation. WOW Woman of the Week: I’m not sure when we last commended Karin Tulloch for her many contributions to Go WOW. Most recently this would be her coordinating the pieces for the upcoming Golden Gate Relay. You are awesome Karin. I love running with you! Watch this series of 4 videos leading to the culmination in our next session of Couch to Accomplished. Videos 1 and 2 are now available. 1. Your perfect body. You’ve already got it! Next Couch to Accomplished Series starts May 7. You have heard me talk about heart rate at different ages and working out at 100% or 65% or somewhere in-between. You might have even heard me tell you that you will sometimes work at 105 or 110%. What? The chart below helps to show the approximate pulse rate, at different ages, for different levels of effort. It is remarkably accurate given that we think of ourselves as so different, from one to the next. How does this apply to our workouts? Track workouts should be at the 100 – 110% level in most cases. This chart is based on a 2 mile run. Track workouts often don’t come close to moving that far and make it up by adding extra effort to the workout. Endurance workouts should be in the 65-80% range. Why? You already know the drill. We have different goals for each of our workouts and these paces help you accomplish those 3 different workout goals. Did anyone try the granola recipe? Tell me what you thought? Post your response on Facebook or our website. Thanks. Fill in your workouts online through our WOW Team/Strava Challenge (Kim C joined!) or continue using the paper form for the WOW Team Challenge. Your choice but be sure to DO IT! If using Strava just list Go WOW in the title of your workout to distinguish it from other non-WOW workouts you do each week. Enter cycling and running, and walking workouts. I’ve been listing all my workouts based on time, not miles. You can do both but I will only list my races with times. This will keep the rest of my information a bit private while still sharing the important stuff and keeping me “honest”. I’ve been out of town for a few days. Of course I missed my WOW Buds. It is good to get away once in a while and experience a change of pace. Training continues and our novice members are getting stronger every week, even when I’m not around. Thanks to Lauren Ganes for heading up the Sunday training at Heather Farms. Also congratulations to all racers last weekend! From 2 local trail races, a run across the Golden Gate Bridge, a half marathon in San Luis Obispo there were a large number of WOW Women out there moving! Misc. details and photos are on Facebook. What would we do without Facebook? The Golden Gate Relay gals will be showing their stuff this coming weekend. Your WOW Team wishes you a wonderful experience. Keep us posted on your 24 hour escapade. Sounds crazy and like a lot of fun! I’m cutting things short due to lack of time but will see you on Wednesday, April 29 and look forward to “catching up”. WOW Woman of the Week: Let’s give a shout out to Janet McGee. Special lady who drives over from SF on a regular basis to join us. We like it when you join us Janet. Come often! WOW Woman of the Week: Shout out to returning Member Kathrina Weekes! Now you have to come see us a bit more often, OK? Promise? Is the See Jane Run 5K on your list for this year? Coach Tip of the Week: Race let-down. It is common to put a lot of effort and expectation into your race training. Distance doesn’t matter. It is the mental, emotional commitment that you put into your training that makes reaching that goal truly important. When it’s over, then what? It is extremely common for a sense of let-down and loss. Like, what just happened? You trained hard, you got nervous and excited. You raced! Now it’s over. Oh my! You are not alone. I mentioned to our group on Sunday, we at Go WOW Team want to make fitness something you include in your life on a regular basis and hopefully, for as long as you can move. One of the benefits of this club is that, because we always meet, every week, all year. You just need to get yourself out here even when you are a bit down. We’ll get you moving! On to See Jane Run! As I also mentioned on Sunday, this is our first week of training for the See Jane Run 5K and Half Marathon (also, on same weekend, the Zooma 10K and Half Marathon). So, welcome new trainees! We’ve got your back. Also, it’s not too late to join us for training. Now is the time! Jump in! You long time members, or recovering ORF (or Livermore) racers, it’s all good! I look forward to training with you at all your individual stages. Let’s not forget to appreciate what we all have…the gift of moving our bodies! Link to the WOW Team Challenge Form. Are you filling in your WOW Team Challenge Form? We have several members who have claimed their 10 hour dog tag. Who will be next? Marathon Minute: from Coach Lauren – It’s short so I decided to post the whole things right here. You can also refer to it at the following link on our website. Fitness and friendship, is there anything better than that? The warmth and support of the WOW team provides the opportunity for women to explore, succeed and reach goals they never dreamed of. The last few weeks have been hectic and exciting and brought out the best in you WOW Women. Congratulations to all racers and especially for the time you devoted to training. That’s where the commitment lies. That’s where the improvement comes from. It’s also a place that I know many of you appreciate having those WOW Buddies out there to keep you pounding the pavement, week after week. I want to offer a special congrats to those ladies who ran the half marathon. The amount of training is significant and they followed through week after week. I think almost all of our runners had personal bests. Rosa Kaderas-Redmond came in under 2 hours with almost 2 minutes to spare and 2 minutes better than last year. Nicole Dryden finished her fastest half marathon yet by about 4 minutes! Allison Hickey ran her first half marathon race with control and, of course, a best time ever! Cecilia Han just gets out there and moves! I’m not sure about your time. Lizette Byer ran the whole race with her daughter making this possibly the best half marathon she’s ever run! We’re super proud of you all! I want to thank all of you who jumped in to help out with details where you could. The leaders of the relay teams took on extra responsibility to make sure their teams had the pieces together. Thank you Leaders! The volunteers who helped out at the Expo on Saturday were invaluable. We got a good bunch of names to add to our mailing list. The group on Sunday who helped set up and managed the tent included Lauren Ganes, Sandy Baird (Dr. Baird), and Joanie Zecherle. All three of these ladies spent hours out there serving us, helping us, encouraging us racers. It was a big sacrifice of time and does not go without appreciation. Thank you again everyone and congratulations to all you fine racers. It was fun, wasn’t it? Now we head into training for the See Jane Run 5K and Half Marathon. Our orientation on Saturday and trail run on Sunday showed interest in both the 5K and Half. Currently I know we have Marybeth Temples, Kim Connor, Holly Haley, and Faith Enemark planning to do the 5K. Who else is training for either one or the Zooma races in Napa (same weekend)? Keep me posted. I’ll try to keep a list for you to know who is doing what. Also, just to see how many read this far, we have a 20% discount at See Jane Run by using code PROMO20. Be sure to enter you team as Go WOW Team. Vote for a Fall Half Marathon and 5K. I’m soliciting votes for a fall half marathon and 5K Destination Race. We always have so much fun with these! Any suggestions are welcome but I am especially looking into the Wine Country Race in October or Big Sur again in November. Both of these races fill early so, once we determine our race, you’ll need to make a commitment. Make your comments on Facebook please. #3 See Jane Run from 2012? Note: If you have a question please post your question on the WOW Team facebook page and I’ll do my best to post a response there within 1 business day. Go WOW Team! Last week of Best Run Club Voting – Vote Now for Go WOW As the Best Run Club in The SF Bay Area. Thanks! WOW Woman of the Week: Beth Wrightson, Welcome Back! Coach Tip of the Week: With less than 3 weeks before the Oakland Run Fest I hope you are getting excited! Preparing for a race takes the physical work and the mental/emotional commitment to follow through and stay focused. You have made good progress thus far and the light is out there, at the end of this tunnel! Stay on task, feel grateful that you are able to train well, and take advantage of all the support out there for you. Race day will be here very soon and we all have much to be thankful about. Being able to train is a gift from many different angles so STAY FOCUSED, BELIEVE, and KEEP MOVING. You are almost there! Marathon Minute: from Coach Lauren – This week’s article is about hydration. Everyone needs to know about hydration energy. This article is a good place to start. Starting Week 10 of our ORF Training! And you ladies are looking strong! It’s awesome to see our newbies improving and our more experienced runners taking on extra distance or faster speeds. Yahoo! You are making this happen! This weekend at Moraga Commons will be the longest run for the half marathoners at 14 miles total. This is called over-distance and is intended to make you comfortable with the absolute knowledge that 13.1 is well within your ability. Be sure to bring extra energy in the form of Gu’s (or Chomps, etc.) and electrolyte drinks. Test this stuff out now. Don’t wait until race day. You 5K runners and walkers got a chance to check out the course last Saturday and should feel confident and relieved at the ease of this course. It’s straight forward and almost all flat. This Sunday I want you to do the 1 minute hard, one minute easy for 11 cycles. This will take you through a good portion of your actual race time and will help build additional confidence. The remainder of your 60 minutes should be at a good clip since you are in pretty good shape by now. And you relay folks are going to have so much fun! Be sure to touch base with your team-mates as there is some confusion still about how the teams will organize runners and arrange transportation, etc. Facebook works quite well for this. By now you should also have your relay team-mates email addresses and phone numbers for direct communication. For the weekend plan to do 90 minutes with the second half faster than the first. Thank you to our Saturday ORF Aid Station Volunteers Alice Tsai, Nancy Rivard, Lauren Ganes, and Eileen Killory. I know the WOW Runners loved seeing their pals at these water stations and many of the runners who came through expressed their appreciation. Volunteers Needed at the Saturday Expo for the Oakland Run Fest and for the Sunday WOW Tent. We are in need of volunteers for the Saturday Expo from 9AM – 6PM. Lauren has offered to help set-up on Friday evening so I’ve got this part covered. Dr. Sandy Baird, Lauren G, and Joanie Z have offered to help on Sunday, race day.So, I need you to volunteer for 1-2 hour shifts at the expo on Saturday. This can be done in combination with picking up your race bib. It’s usually a lot of fun, honestly! Post your ability to help on Facebook with a 1 – 2 hours timeframe. I’ll put together a schedule as the posts come in. Thank you! Use our WOW Team Discount Code WOW to save $5 if you haven’t already signed up. Now is also the time to confirm which event you’ll do. Will it be the 5K, the relay, or the half marathon? To sign up for the 5K or half marathon, go directly to the ORF site at http://www.oaklandmarathon.com/. Vote for a Fall Half Marathon and 5K. I’m soliciting votes for a fall half marathon and 5K Destination Race. We always have so much fun with these! Any suggestions are welcome but I am especially looking into the Wine Country Race in October or Big Sur again in November. Both of these races fill early so, once we determine our race, you’ll need to make a commitment. Make your comments of Facebook please. Congratulations to Alice Tsai who participated in last weekend’s Chinatown New Year’s Race in San Fran. How did it go? And let’s wish Gina Hewlett good luck for her relay this coming weekend. And finally, it’s not too early to start thinking See Jane Run 5K or Half Marathon in June. Meet me at the store in Oakland this coming Saturday, March 7 for an informal short run and talk. We will also hold an official “Meet and Greet” night on March 24, and training starts March 30. Mark your calendars! Don’t forget that our time “springs forward” this weekend. We’d hate to miss you because you slept in too late. Success Teams and Zip Code Community Groups. These separate lists are meant to offer resources to you in the way of other people in our group. The Success Team (renamed from Running Buddies) List is intended to mix experienced members with less experienced members who have similar paces or similar fitness interests. The Zip Code Groups were formed around zip codes. This list gives members the opportunity to carpool and arrange more casual workouts in your local neighborhood. Both of these lists were handed out. If you need one (or have corrections to make) please contact Lauren Ganes at lganes@gowowteam.com. It is our hope that you will actively participate in the Success Teams. We ask that you make the effort to learn your group members’ names, recognize their faces and touch base with them at least 2 times per month. Initially this may be by email but it can easily morph into greeting each other at the workouts (by name)! The Success Team Goal is that each of you will put in the effort to support each other through acknowledgment, encouragement, and actual communication as we all strive for similar goals. Let’s keep each other accountable and focused on what we all want – to be fit and feel good about being part of Go WOW Team. Have you said hello to your Success Team Buddies in the last 2 weeks? If not please email or say hello at the next workout. Where Did the Time Go? It’s Almost October! WOW Woman of the Week: I have to thank Tres Fontaine big time for all that she does for this club. Tres you are an awesome athlete and also as generous as they get. Lucky WOW! I just realized that I have actually written 260 Weekly Pep Talks. Yowza! Book Reviews Needed. Will trade for books! If you will take the time to review one or both of my new books I will be happy to send you a pdf version to download. This means that you don’t have to purchase the book and can have full access to the material today. What I need in return is a review to be placed on Amazon.com on September 22 (for the newest book) and ASAP for the other book.. Are you interested? Only 20 words from you could make a big difference in sales. Thanks for the LOVE! Contact me by email at StephanieAtwood@gowowliving.com and I will forward a pdf attachment right away! To make a review you just scroll down the page where the book is featured on Amazon. It’s easy. There are examples of other reviews to help you understand. WOW Woman of the Week: Leticia Duenas is one of the longest term members in Go WOW dating back to 2005! This was actually before WOW started and I was coaching for See Jane Run. At that time Leticia was single and without children. She is now married and has two young boys! Talk about some life changes. Thank you for your friendship and support of WOW Leticia. It’s been quite a journey and we’re just getting started! September Birthdays: Jacqueline Rickman, Jessica McElroy, Janet Mc Gee, Tami Price, Mayra Montoya, Sharon Alberts, Joann Denning, Mary Sue Weston Thomas, Sophie Jani, Tiffany Akins-Dunbar, Dawn Robinson, Julia Halsne. Happy Birthday September Girls! Coach Tip of the Week: Race week! This is the time to focus on lots of rest, eating good, healthy food, staying hydrated, and visualizing your race day. I encourage you to mentally picture and physically go through the transitions from swim to bike to run (triathlon) or run to bike to run (duathlon). This weekend will be a learning experience for all of us and should also be fun! Be sure to plan to join us afterward for breakfast at Dean’s Restaurant in Pleasanton. Marathon Minute: – http://www.gowowteam.com . Stepping out of your comfort zone? Lauren shares her recent experience with this. Last Sunday at Point Isabel was so much fun! We had new faces – Jennifer; returning faces like teachers Erin Conklin, Kathrina Weekes and Kathleen Gadway; and we also had some women checking out their bikes after taking a few decades’ hiatus – Go Ellen Gordon! It was also nice to see Jessica Mangaccat, Tricia O, and Julia Halsne walking their dogs. And of course we had a super group of runners and walkers who show up on a fairly regular basis and make it all worth being somewhere by 8AM on a Sunday morning. Super Sunday. Really fun! While the triathlon is the big thing for this weekend and we encourage all of you to come out and participate or support The TEAM, we also have a workout planned at Emeryville Marina. Lori Whittock will head up that workout for runners and walkers with our half marathon trainees going for 10 miles or 120 minutes (whichever comes first). Thank you Lori, for helping out! I’m still checking on details for our triathlon this weekend and will be organizing a call-in on Thursday evening. If you have any questions or comments about the triathlon OR Broads Run Broadway feel free to call in on Thursday, September 18 at 5:30Pm to talk with Lauren Ganes and Me. The call in number is 1 712-432-3011, Conference Code 211360. Also check on Facebook for updates. Welcome to newest member Lynn Sanderson! Here’s to a great race this weekend to all you tri and duathletes! Belly Fat Blowout reduced price from September 17 – 20. If you haven’t picked it up yet, here’s your chance at a reduced rate. 72 hours only. Both Book 1 and 2 are available for only a brief period of time at reduced rates. Also reduced is Belly Fat Blowout 2, the sequel. 72 hours only! Fresh to Freezer Meals for One: Quick and Easy Complete Meal Plan, Shopping List and Recipes. Please leave a review on Amazon. Scheduled for release in October! My books are also available online at our new website at http://gowowliving.com and on Amazon in Kindle format and paperback. Photo #3 – Happy Birthday! Photo #4 – Go triathletes and duathletes! Photo from the AASK Walk/Run around Lake Merritt in August. Amazing! WOW Half Marathoners completed 130 minutes of running on Sunday at beautiful Inspiration Point. And this Sunday they will increase their time and or mileage to 140 minutes or 13 miles (whichever comes first). This is an incredible accomplishment! Thank you, Coach Stephanie for creating a great training program. It is so wonderful to know that on Sunday mornings you will have friends to run this long and increasing distance with. As you add these longer distances it is important to stay hydrated. Hydration begins now, during the week, by making sure you are drinking plenty of fluids. Since it is currently cold, in addition to water, you might want to include tea or soup to stay warm. Lemon-Lime Gatorade will be at the 8 Aid stations along the Oakland Marathon course, make sure you try it before race day. If it doesn’t agree with you, make sure to try another electrolyte liquid like Nuun or Gu Brew. You want an electrolyte liquid with sodium, potassium and calcium. Try to have 16 ounces of electrolytes with you this Sunday. I always use my 1 minute of walking as a time to hydrate. The electrolytes help maintain the hydration of your leg muscles. You don’t want a side stitch or muscle cramp to interfere with your run. A WOW member, Kara Waltz, who is a chiropractor and soccer player told me that she drinks a large glass of water and another glass of electrolyte liquid on Saturday night before training, races, or games. After your long run it is equally important to eat some protein within the first 30-60 minutes. Additionally, drinking an electrolyte liquid all afternoon will aid in a faster recovery. Hydrating early and often is a key to a successful half marathon. Happy New Year WOW Women! We are kicking off the season with training for the Oakland Half Marathon, March 24, followed by training for the See Jane Run Marathon in June. However, a stalwart group of WOW women made their resolution last August to walk the 26.2 mile Oakland Marathon! What an incredible goal! This will be the 4th year of the Oakland Running Festival which includes a marathon, half marathon, relays and a 5K. There is a special excitement to this race that is right in our home town. People are out there cheering you on with drums, music, the wall of fire at the Crucible, and fairies from Fairyland blowing magic bubbles. All of the WOW Team Members will find something special with the way they choose to participate in this event. The following women; Andrea Cruz and Teresha Freckleton-Petite have steadily been training to reach their goal of walking the full marathon They are now up to walking continuously for 4 hours! This certainly takes discipline, dedication and tenacity to train to walk a full marathon. Coach Stephanie was instrumental in having the Oakland Marathon include walkers for 2013. And she has followed through with creating the training program so that the WOW Women will be successful in reaching their goal. WOW Marathon Walkers you are an inspiration! WOW Woman of the Week: Cynthia Bagby is going for it. Keep it up! You are getting there! Tip from your Coach: A mile run or walked will use about 100 calories. The difference is that 4 miles an hour (15min/mile) = 400 calories. 6 miles an hour (10 minute miles) = 600 calories. Pick up your speed and utilize those calories faster! Upcoming Events of Note: This is not the total WOW Calendar, only certain special events. 50 in 100 May 1 – August 8(see details below) Help Coach Stephanie recruit 50 new members in the next 100 days. Win Prizes! 3 0 days left! Keep thinking new member. We’re making progress but we’re not there yet! July 4 – No WOW Workouts!! July 15 – Kick-off Training for San Jose Rock’n’Roll Half Marathons at Lafayette Reservoir – full day for newcomers, short run and intro for current members. Thanks to Kara Waltz, Dr. of Chiropractic, who spoke to us last Wed. Her talk was educational and inspirational and I hope you enjoyed it. We have a bit of a break between now and our next speaker. Loretta Green-Williams is a fascinating woman, 58 years old, who just qualified for the 100m sprint at the Stanford Senior Olympic Trials. Come to hear Loretta’s inspiring story of overcoming personal tragedy and knowing triumph in her ability as a runner. Loretta will join us at Las Lomas Track on July 18. Our weekend had Saturday walkers and Sunday runners, run/walkers, and walkers. Welcome new member Rebecca and thanks to all of you who taught Rebecca what 1:1 is and what a great group of women you are, overall! Great to see Rowena last Sunday! Christy had several walkers lined up for Saturday at Lake Merritt. I didn’t get a report but hope everyone got some good exercise. I’m gone starting on Sunday, for a week long Coaching course taught by United States Track and Field. We’ve got workouts as usual with our wonderful WOW Mentors pitching in. Thanks to Christy, Michaela, and Lauren for leading these workouts. Good luck to Laura and Eileen who have races coming up on July 8th. Please report back to us on the Winners’ Circle. Remember to believe in yourselves, in your training, and in your flexibility to overcome those darn unknowns! And now on to the topic of the day, you! I want to make sure that each of you understands what resources are available to you through WOW and briefly how they all fit together. The WOW Team website is the place to join our group as a long term member, to review blog posts, have access to the Members Only Area, get directions to workouts, and get a condensed version of workouts through the WOW Team Calendar. Please go to http://gowowteam.com at some point and click on the various and sundry tabs at the top. Meetup is the site where full details of each and every WOW workout and event are listed in chronological order. Each separate event has its own page, connected by a monthly calendar on the left. You must join the WOW Team meetup (not just meetup in general) to take advantage of most of the information. The WOW Team meetup site is also the only place to RSVP and pay if you are a drop-in. When you are a member you are not required to pay when you drop-in. Just click past the payment request section. URL for home page is http://meetup.com/gowowteam. To join Meetup, you must sign-in to meetup (one time thing) and then log-in to the Go WOW Team Meetup site every time. The opportunity to reach your full potential as an athlete, make friends, place fitness as a part of your daily life. WOW offers these pieces! Starting August 4, WOW will be training a walking group to walk the Oakland Marathon or half marathon. We will ONLY Train for walking on these Saturday workouts. If you want to run or run/walk in the Oakland Run Fest the WOW Team will provide Sunday training for the half marathon, 5K, and relay, no marathon. I’m getting the training schedule together now. If you are interested, let me know and tell your friends! 25. Just send me a check for $40, include your birthday, age on race day and t-shirt size and you’re in! Over Fifty Interviews – I am starting to interview women who are still running and are over fifty. For some of you, you may have started running quite late in life. For some of you, you may have been doing this for a lifetime. Initially, I will do a recorded interview and, eventually plan to create a book from the material. If you are willing to be interviewed I would love to speak with you. All women over fifty are welcome and matter. Please tell me if you would like to participate and we will arrange a time to record the interview. Thanks! July 28 5K/10K Race in Orinda – This link below sounds like a fun run for us to participate in. It is a trail run in one of our beautiful East Bay Parks. The price is affordable. Who else is in? July 28, Briones 5K/10K East Bay Park Runs – http://www.runintheparkseries.com/index.php/briones_5k_10k Let’s keep posting about this series on our Facebook Page at Go WOW Team or The Winners Circle. One super speaker has already spoken. Please keep the momentum and appreciation for the effort the women make to come and speak to us. San Jose Rock’n’Roll Half Marathon Here we Come! Monday, July 16 is the first week of training for the upcoming San Jose Rock’n’Roll Half Marathon, happening on October 7. We will also train for the Humboldt Half Marathon on October 21. To RSVP for the training kick-off on July 15 go to meetup. I will contact them by email and/or phone and mention that we want them to join us and that you felt it might be a good fit. That’s all there is to it! Thanks for your help and Go WOW Team! I’d love to see our Walnut Creek group grow! What are your thoughts on ways to make this happen? Thanks to the wonderful photographers who give us so much to smile about. Photos are wonderful memories! Note: If you have a question and are not yet a member of the WOW Team, post it on our Go WOW Team public Facebook Page and I’ll do my best to post a response there within 1 business day. Members can post on The Winners Circle, our private facebook page. I’ll check in on both. Go WOW Team! Did you know that WOW offers workouts throughout the Bay Area every week? Join us soon. Drop-in any time! Our main meetup site lists chronologically and shows a calendar of ALL WORKOUTS, EVERYWHERE. Please join meetup to RSVP and receive reminders. Note that you can adjust the level of reminder in your personal account settings so that you don’t feel bombarded with notices! Go WOW Team on Meetup – Walnut Creek, Concord, Pinole, Martinez. This is a feeder site so please join our main meetup and remove your name from this list as you will get limited information. Go WOW Team on Meetup – San Francisco. This is a feeder site so please join our main meetup and remove your name from this list as you will get limited information. Join Coach Stephanie of the WOW Team as she brings you an exciting addition to women’s fitness. The Fit Women Series, From Couch to Accomplished, offers in-person and virtual conversations with women who have made fitness their business and/or their lifestyle. From world class racers to fitness experts in nutrition, chi, psychology, injury prevention, to women who started running after fifty (or have run for most of fifty years! ), this series offers insight into the women who have overcome obstacles and chosen to make good health an integral part of their lifestyle. Each woman will share a segment of her own personal struggle and where she is now with fitness in her life. Finally each will offer tips and tricks to help us in our pursuit of a fit lifestyle. June 20, Walnut Creek – Verity Breen will share her story of running FAST. At 45 she continues to break records and says that 2012 will be her year to finish a half marathon under 1 hour 20 minutes! Verity has qualified 4 times to compete with the Australian National Team and much more. Look her up on Facebook. Her quote “My main goal is to evolve and live the most authentic life possible, speak the truth, trust the truth and live up to the name I was born with”. June 27, Piedmont – Dr. Kara Waltz Chiropractor, athlete, and world citizen (WOW Team participant, too) will talk about how she came to chiropractic. Kara’s humanitarian efforts in Haiti and her current practice at Elements of Being in Oakland offer an interesting story. You will learn the benefits of preventative treatment and will hear a story of a woman who has come far on a journey to learn and grow herself through giving and offering her chiropractic skills and talent to others. 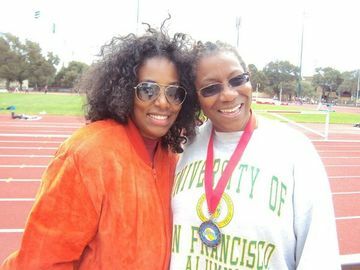 July 18, Walnut Creek – Loretta Green Williams,58 qualified this year at Stanford for the National Senior Games in the 100m. We can’t let age hold us back! The WOW Team is hoping to add 50 new members in the next 100 days and we want YOU! 2. More than 7 neighborhood workouts (walking, running, speed work, and tempo runs) each week throughout the greater Bay Area. You may attend one or all! 4. Ongoing enrollment. Join ANY time! The WOW Team was voted Best Bay Area Women's Run Club for 2012 by an ABC7 Poll. Join the BEST. Be Your BEST! Ready, Set, Go! WOW women are more than ready to take on the See Jane Half Marathon! We all owe Coach Stephanie our gratitude for marking the course for us. We now have the psychological edge of knowing the course. THANK YOU, COACH STEPHANIE! And our heartiest thank you goes to Lizette who kindly kept a water station for us. We wish her well on her 100 mile bike ride on June 3! Go, Lizette, go! We are cheering you on! Christie and Kathy going strong on their first 13.1 mile practice run. Do you remember how you celebrated your 30th birthday? Bravo to Christie A. who celebrated her 30th birthday by running 13.1 miles for the very first time! And Bravo to Kathy W who also ran 13.1 miles for the first time! Way to go ladies, and you looked strong as you came to the finish line. Brave Evelyn joined us and ran the 5K course. Ellen also ran, and Vera, Pat, Rebecca, Beth, Lauren, and Coach Stephanie all completed 13.1 miles. Next week we will be in taper mode, running 10 miles.